Did you ever wonder why cheap wine tastes better in fancy glasses? Why sales of Macintosh computers soared when Apple introduced the colorful iMac? New research on emotion and cognition has shown that attractive things really do work better, a fact fans of Don Norman's classic The Design of Everyday Things cannot afford to ignore. In recent years, the design community has focused on making products easier to use. But as Norman amply demonstrates in this fascinating and important new book, design experts have vastly underestimated the role of emotion on our experience of everyday objects. Emotional Design analyzes the profound influence of this deceptively simple idea, from our willingness to spend thousands of dollars on Gucci bags and Rolex watches to the impact of emotion on the everyday objects of tomorrow. In the future, will inanimate objects respond to human emotions? Is it possible to create emotional robots? Norman addresses these provocative questions-drawing on a wealth of examples and the latest scientific insights-in this bold exploration of the objects in our everyday world. Donald A. Norman is both a computer scientist and psychologist. In 1988 he published “The Psychology of Everyday Things", a book about the usability and the design of everyday things. Critics said that designers who follow Norman’s guidelines would create perfectly usable but ugly objects. 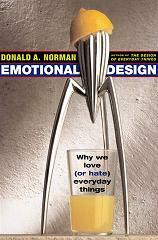 “Emotional Design" is Norman’s response. Norman outlines a psychological model of emotions consisting of a visceral, a behavioural and a reflective level. Each of which corresponds to a part of the brain: visceral = the automatic, prewired layer, behavioural = the part that controls everyday behaviour and reflective = the contemplative part of the brain. This psychological framework provides the structure for most chapters in the book. The author illustrates how various aspects of design relate to the three emotional levels and how the three levels are connected. Norman states that attractive things work better, i. e. user perform better in usability tests, and that attractive things even sell better, e. g. the Apple iPod and the BMW Mini. Apple’s iPod for example satisfies all three emotional levels: its beauty appeals to the visceral level, it is a pleasure to use it and people take pride in owning and using the iPod. Two chapters are about emotional robots. Norman describes in detail how home appliances will evolve into robots. He believes that robot tutors have the potential to play a major role in education. However, Norman predicts that interaction with robots depends on emotions. Robots must be able to detect the user’s emotions, as well as express their state in an emotional way. He argues that some people took Joseph Weizenbaum’s “artificial intelligent" programme ELIZA for a human psychiatrist. In a similar manner interacting with “artificial emotional" robots will come very natural to most people. “Emotional Design" is a well written introduction to the topic of emotions in computing and design. The book has the right amount of profundity, practical experience and wit. Norman provides further references to background literature. He also touches a lot of current issues like affective computing, e-collaboration, mass customization and weblogs. Some sections are rather anecdotic or amusing, for example Norman’s predictions about emotional robots. However, emotions are a hot topic and this book is the best starting point for people trying to get acquainted with the subject.